It was a good news, bad news kind of night Friday in Walla Walla. On the positive side, Coupeville’s Makana Stone was back on the floor after missing a game with a sprained ankle. But while the former Wolf was running seemingly effortlessly after sitting a week-plus, and went off for a team-high 16 points, Whitman College came up just short in the biggest game of the year. With Stone padlocked to the bench after picking up a phantom fifth foul with two-and-a-half minutes to play, the Blues couldn’t hold on to a one-point lead in the final minute, falling 61-57 to visiting George Fox. The loss gives Whitman a season split with their biggest women’s basketball rivals, with both teams winning on the other’s floor, and it comes at a crucial time. George Fox, the defending Northwest Conference champs, moves to 12-1 in league play, and sits a game up on Whitman (11-2) with three to play. Whitman, 17-5 overall, has already clinched one of the four playoff berths for the NWC postseason tourney, and can finish no lower than third in the final standings. The Blues finish their run through the nine-team league with a string of tough games. After hosting #4 Linfield (7-6, 11-11) Saturday on Senior Night, Whitman closes the regular season on the road Feb. 15-16 against #3 Puget Sound (10-3, 17-4) and #5 Pacific Lutheran (6-7, 13-8). Friday night’s rumble with George Fox pitted the top offense in the Northwest Conference against the top defense. In the end, the defense triumphed … with a little help from the refs, who compounded the call on Stone by also whiffing on a crucial non-call with 12 seconds to go which would have given Whitman a chance to tie the game. Right before fouling out, Stone hit a huge bank shot to cut Whitman’s deficit to 51-49. Even after losing their top scorer and rebounder, the Blues hung tough, taking a 53-52 lead with a hair over a minute to play, thanks to back-to-back buckets from Taylor Chambers, who hadn’t scored all night. Whitman then shrugged off a George Fox three-ball thanks to a nifty Natalie Whitesel reverse layup which knotted things at 55 all. The final 30 seconds, though, belonged to Bruin star Emily Spencer. A demon on defense all night, she stepped up to drill the already-mentioned trey, then put George Fox ahead to stay with a slashing layup with just 26 ticks left on the clock. Whitesel had a chance to go to the line, but all three refs ignored the Prairie High School grad being hammered by a host of Bruins on the ensuing layup attempt. From there, George Fox swished all four of its free throw attempts in the game’s final 10 seconds, with Spencer appropriately dropping the final daggers, and Whitman’s last chance wafted away. The game started as an offensive show, with Stone slamming home six points in the opening quarter, to go with 10 from hot-shooting teammate Mady Burdett. While Whitman trailed 22-20 at the first break, thanks to George Fox scoring right at the buzzer, the Blues looked strong. And no one played as effectively as Stone did, as she picked the ball from a George Fox ball-handler and went coast to coast for a breakaway bucket. On defense, she was equally a force, rejecting a shot and twice forcing opposing post players into committing travels as they tried to get around her in the paint. A Burdett three-ball capped a 7-0 Whitman run, sending the Blues into the locker room up 33-30. That stirred positive memories of the first meeting between these teams, for everyone from the announcers on the internet stream to random people watching the feed in ice-covered Coupeville. Back on Jan. 12 in Newberg, OR, Whitman savaged George Fox in the third quarter and turned a three-point halftime bulge into a 73-54 blowout. Friday night, however, the Blues went cold from the outside, and it hurt them. After scoring 13 in the first half, Burdett was held scoreless across the game’s final 20 minutes. Meanwhile, Whitman, the best three-ball-shooting team in the league, suffered through a 3 for 17 performance from behind the arc. Stone did what she could, powering her way to three more buckets in the third, but Spencer stung Whitman for the first of many times, popping an offensive rebound back up and in with a single second on the clock. That staked George Fox to a 45-44 lead heading into the fourth, and then the ref’s glaucoma became an issue. Stone, who missed a chunk of the game after injuring herself against Whitworth Jan. 29, then sat out against Lewis & Clark Feb. 1, made her return an auspicious one. Netting her 16 points on strong 8-11 shooting, she also ripped down six rebounds, pilfered two steals and rejected a shot in 27 minutes of floor time. 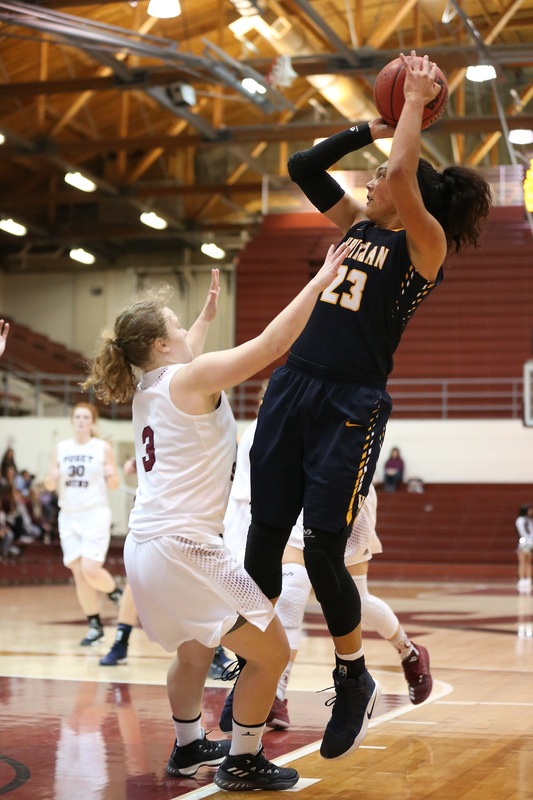 On the season, the Whitman junior sits with 313 points, 181 rebounds, 38 assists, 25 steals and 18 blocks. Stone is shooting 132-257 from the floor and 48-62 at the free throw line.